The Sole Fitness S77 Non-Folding treadmill is a treadmill that was released into the market in 2010 and onwards. It is a treadmill that is touted as a “club quality” treadmill. The S77 is stable, MP3 compatible, has a very simple dashboard interface, and comes with an advanced LCD screen, making it extremely user friendly and virtually painless to use. The treadmill is also on the lighter side, weighing in at only 265 pounds (which is light for a non-foldable treadmill). The price for this treadmill will currently run you about $1,699.99 for the newest model, while last year’s model is several hundred dollars less. There are pros and cons when it comes to this treadmill regardless of which Sole Fitness treadmill model you consider. This is a positive that comes with being a non-foldable treadmill, and a positive that is very quickly learned. Many other models of treadmills, for example the old Nordic Track treadmills, could fold. These treadmills would always have weak shock support because of that fact. Having an affordable treadmill out on the market that is a stable, non-folding product makes all the difference when it comes to having a supported work out session. The LCD screen is very easy to navigate and access even while running. Both the LCD and the buttons stay responsive even if sweat drops onto the LCD or dashboard. 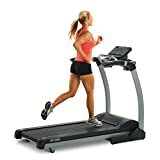 This is convenient because if you need to change speed or incline on the fly, you will not have to worry about the controls of the treadmill suddenly becoming unresponsive. The treadmill also has incline changers and speed changers located on the handles of the treadmill too. To fight off boredom while exercising on the treadmill, you can plug in a phone or iPod to listen to your MP3s with virtually no hassle. All you need is an audio jack to connect your preferred device to the treadmill, and the songs will play directly out of the built in speakers loud and clear. The S77 treadmill line has a running area that seems to increase every year. The size of the track is very comfortable, and both inexperienced and experienced runners will have enough room to feel on track. This is important, considering most inexperienced runners have the tendency to drift either left or right when running on the track. This is a good thing for those that want to run while being on the muscular/heavier side. for example, a muscular guy edging about 245 pounds will never have trouble with the track stopping under their feet after touchdown on the track. This treadmill is not ideal for doing interval training. The treadmill takes far too long changing from speed to speed. Even with the easy to use controls, the motor itself seems to have a hard time running at different speeds in an instant. You might want to consider a different treadmill if you want to solely run intervals. This could go along with the interval point in a different aspect. The S77 simply does not have many built in workout programs to run. Sole Fitness is lacking in this aspect when compared to a company like Nordic Track. The S77 really does not have a way to share or keep track of your runs and routines online either, which is something many other treadmill models have nowadays. Because the treadmill has such a big track to revolve around the machine, the motor seems to be a little overworked when it comes to moving the belt. Many have reported grinding noises while running on the treadmill, and the motor used to run the belt has been the major pinpointed problem in all the complaints. The Sole S77 Treadmill is a decent treadmill for runners that are just starting out or intermediate. It has a bigger running area than LifeSpan Fitness treadmills but also takes up much less room compared to them also. The only aspect that other company’s treadmills beat Sole Fitness in is interval training. The S77’s pros outweigh the cons for both the price and the size though, and would be ideal for personal use in a house, home gym, or a small fitness club.